“What is your focus word for the new year?” The question came to me through a blog post by a friend. I liked the idea of having a word that would guide me through the upcoming year, so I sat down and created my own post about my word. I have made that a habit at the end of every year. Sit down and review my focus word, the steps that I took to follow that word, and make a plan for a new focus word. My 2013 word was “focus” and that led into my 2014 word, which was “consistent.” I am weaving their lessons into my plan for 2015. “What is your power word for the new year?” I just read this on the social media feed of another friend. The image of “power” makes me smile. I want to control this journey instead of being tossed around by the storm of the world. I thought about “power” for my word this year. It would work with my plan to take over the world. “My Father desires that I live in His blessings – so if I’m not living in His blessings then He is not the one out of place.” I shared those words with my husband as we were running errands the other day. Those words have haunted me and joined up with the words of another friend that asked me if I was investing in my success or expecting others to do it for me. Sometimes, I wish God were more like a fairy godmother and would just wield a wand and give me my heart’s desires. Of course, the fairy dust fades at midnight, so that might not be the best deal after all. Sometimes, I want others to step up and produce my success. I have done my part. It is time for them to take the rope and pull a while. Of course, no person cares about my dreams as much as I do and they will never pull as hard for me as I will pull when I believe and determine. I have pushed through the end of this year with boldness spurred on by the National Novel Writing Month. I am committed to writing daily. I have made a plan to take over the world. I have moved into a real office for the first time in my LIFE. I have more focus (2013) and am more consistent (2014) than I have been in a long time. 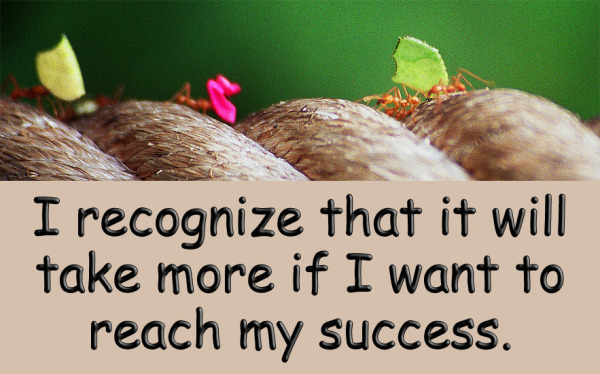 I recognize that it will take more if I want to reach my success. This morning, my Scripture reading let me to Proverbs 10:4b “The hand of the diligent makes rich.” I decided to invest some time into researching the Scripture and the term. The search engine turned up several definitions. Diligent – done or pursued with persevering attention. Diligent – attentive and persistent in doing anything. Diligent – constant in effort or exertion to accomplish what is undertaken; steadily applied. It is not enough to have a plan – or a focus. I must be willing to offer constant effort to accomplish that plan or focus. It is not enough to be consistent . . . for a time – I have to offer persevering consistence until it is done. This year, I will continue to focus and be consistent, but I will be determined in my steps. I will put my head down and push forward – whether the rest of the world is on board or not. I will grit my teeth, close my eyes, and take that next step even when my selfish desires tell me to take a nap. I will keep on keeping on because I know that I car more about this journey than any other person on the planet and only I will get me there.